Loves Rubberstamps Blog: You're Wildly Amazing! Hello Friends! It's Marcy here with some Saturday inspiration!!! So this week is actually Teacher's Appreciation week for two of my kids and there were lots of school events going on. I wanted to make a fun tag for my son, Noah's teacher to add to her teacher's present! This cutie is from the new Wild Child stamp set by The Greeting Farm! This is my favorite set from the new TGF May release and I was so excited to see it in the Loves Rubberstamps store as a new release item! :) I colored this adorable image (one of 2 cuties in the stamp set) with my Copic Markers. Now I probably wouldn't have picked this color for her hoodie, but this teacher loves lime green! :) I actually love the bright colors on this tag! 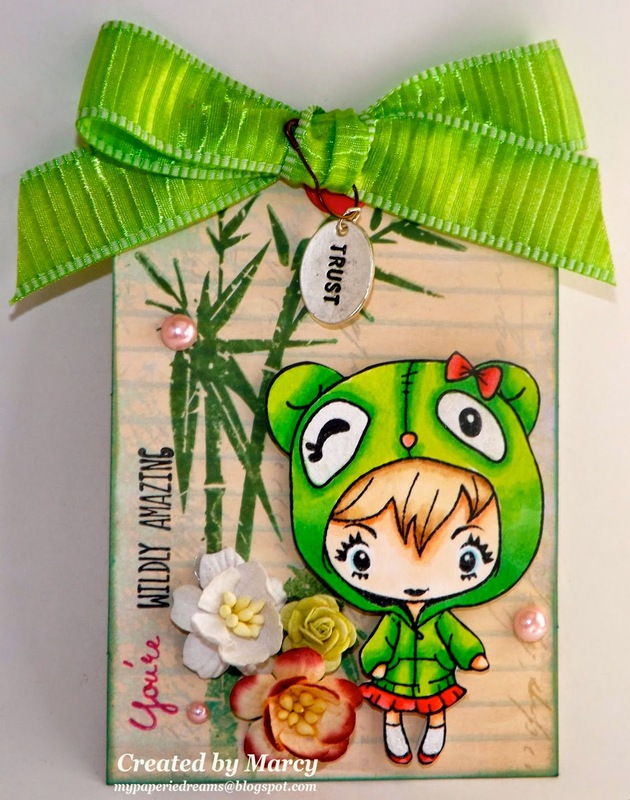 I used an asian inspired theme by stamping some bamboo in the background and then also adding a charm which says "Trust" on one side and has the words in chinese on the flip side. I also added some pretty cherry blossoms and a small lime colored rose from Wild Orchid Craft flowers, some Prima pearls and some ribbon from my stash. The fun tag I used as a base is actually from the new Prima mixed media doll tag pad Handcock Park. I just cut it down a bit to fit on the gift bag. Be sure to stop by the Loves Rubberstamps store to see the items used on my card as well as all the new releases items just added to the store. Dont' forget to come back tomorrow to check out the "Sensational Sunday" blog hop which starts right here!